Strawberry picking in Georgia begins in March and runs through June depending on where you are picking. As you would expect, the pick-your-own strawberries season comes earlier in South Georgia with the Atlanta area peaking from mid-April through most of May. If the season gets away from you, (it always does for me) head to North Georgia for fresh picked fruit later in the season. 5-acres of strawberries. Other farm activities include Belle’s Barn, Jumping Pillow, Cow Train, Pedal Cars and Hayride (all on the weekends.) Restrooms, picnic tables and concessions (The strawberry ice cream is the best around!) 1 gallon buckets provided for picking; return them after use or take them home for $1. Pre-picked berries also available. Cash and credit cards. Monday-Saturdays 8am-6pm and Sundays 1-6pm. You-Pick 1Gal. for $12.00; Pre-picked 1Gal. for $15.00 More farm info here. The Rock Ranch has only one U-pick day during their annual festival. Festival activities include The Rock Ranch’s activities such as Locomotive Train Rides, Pedal Carts, Cane Pole Fishing, Tiny Town, Petting Zoo, Giant Jumping Pillow, Paddle Boats and more. Cash and credit cards. Whitley Farms is a locally owned and family operated business located in Sharpsburg, Ga. Our berries and tomatoes are just about famous in our area and Amanda’s Farmer’s Salsa is infamous and awesome. They begin the season in April and carry it on as long as our fields are producing. Whitley Farm proudly offers fresh, locally, naturally grown fruits and vegetables. This farm was recommended by a reader. They are a family owned and operated farm growing pick-your-own strawberries. Sims is a family run sod farm. However, in 2013, they decided to add You Pick or We Pick strawberries to the farm. In addition to pick-your-own strawberries, they also have pre-picked berries and strawberry and cream ice cream! Yum. Tom and Leigh Anne are local berry farmers that use sustainable farming practices including using their own bees for pollination, to bring the freshest, sweetest and yummiest berries you can pick or buy. They might not be running u-pick until late this year (2019) because of the deer, but they’ll be open! Three acres of strawberries. Don’t miss Farmer for a Day and the Strawberry Shortcake Tea Party, both in April. “Hey”rides, petting zoo, fun park, craft for kids, a visit with strawberry shortcake and more. Cash and credit cards. Strawberry picking and Fun Park open Saturdays: 10- 5 pm and Sundays 12 – 5 pm. 13-acres of strawberries, all pre-picked. 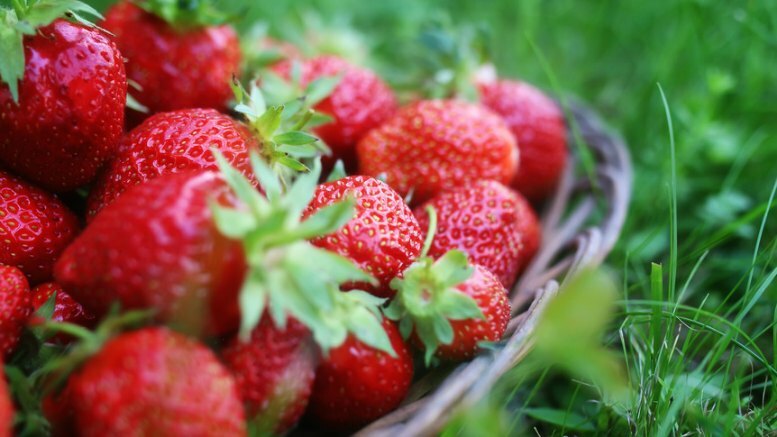 If you want to pick your own, come during their annual strawberry festival, this is the only time to get u-pick berries…plus tons of samples in the market, a strawberry cook-off, local craft vendors, farm tours & more! Two gallon buckets provided, but you must bring your own container for taking berries home. Cash and checks only. Call for times and to make sure they are open. Mercier offers U-Pick on weekends only from 10 – 4 pm. During the month of April they offer tractor blossom tours as well. Also good to note that since Mercier is in North Georgia, the strawberry season starts a little later and will be available a little longer than the fields south of Atlanta. So if you’re a little late in the season, Mercier may be a better place to go. Note that Mercier uses an inter-grated pest control system. The sprays they use are completely water soluble and rinse off with a .10” of rain or fresh water. LCCL is a family run strawberry farm in Rome. We love that they also have a great relationship with a favorite escape, Barnsley Garden. Our family plans to head up there soon, but we got the “scoop” from one of our Barnsley friends…”They have the most delicious and amazing strawberry soft serve ice cream I’ve ever had the chance to taste.” Wow – we can’t wait to get there! This strawberry field North of Atlanta anticipates having strawberries ready to pick the last weekend in March. In addition to picking strawberries, save some room for strawberry ice cream! The little ones can work off their treats at their amazing playground. Unfortunately there aren’t enough strawberries here to pick for 2018, but we are leaving them on the list because they are a bit different than other patches. They don’t have specific hours but you can call to make an appointment. This could be perfect for those with special needs. Cash only. This strawberry picking farm doesn’t keep up their online presence, but you can call to see when the berries are ready to pick. This location does not have a web presence so you need to call to find out when the strawberries are ripe for picking. Be sure to give a call before you drive out (we give you phone numbers below). We’ve looked at several strawberry picking in Georgia lists and many of the farms are no longer in business (or they don’t have a phone). We’ve u In addition, call those in business to make sure there are still plenty of ripe berries to pick when you arrive. Some days farms will be picked out early, Strawberry farms can be closed because they are ripening berries, because rain has made the fields too muddy, or because the field is simply picked out at the moment. Don’t wash the strawberries until you’re ready to use them. Once they are washed, they start to deteriorate faster. When you do wash strawberries, do it in cold water. The later you pick the sweeter the berries, but the darker the seeds. Once you get your bucket home, if there are any left, take half and put them in a flat bottomed dish with a dry paper towel on the bottom. The weight of the strawberries on top will crush the ones below if left that way. Keep the caps on the strawberries until you are ready to eat them. This will keep them fresher. Store strawberries in the refrigerator to keep them fresh. Halve, quarter, or slice clean berries into a bowl or shallow pan. If desired, berries may be crushed rather than sliced. Sprinkle sugar over berries, using 1/3 to 3/4 cup sugar for each quart of fruit. My friend Karen has an incredible food blog called In the Kitchen with KP. She has the most delicious recipes including these wonderful ideas on what to do with all those strawberries. Overnight Strawberry Stuffed French Toast: This one requires a little more work, but it can all be done the night before. Then while the toast is baking, you can cut up the strawberries and add a little sugar for the topping. Perfect for a fancy brunch, or just a special breakfast. Have a special strawberry recipe you’d like to share? Leave us a comment! 5 Comments on "20+ Sensational Farms w/The Juiciest Strawberry Picking in Georgia (2019)"
yall need to check out Elliot’s down in Lizella..or there abouts. They’ve everything a family or group would love…. made ice cream, animals, pick your on or they will, great farm and really nice folks! You have twin oaks listed as north of Atlanta, it is in fact about an hour SOUTH of Atlanta. Your list of strawberry farms in Georgia is great. See more wonderful tips for strawberries growers.